Facial pain is the presenting symptom of a broad spectrum of diseases. Apart from the Neurogenic pain disorders, intraoral pain disorders, temporomandibular pain disorders, orofacial pain can be a presenting feature of intracranial disorder, pimary headache syndrome, referred from ear, eyes, nose, paranasal sinuses etc. The facial Neuralgias occur due to the involvement of cranial nerves and occur as brief episodes of shooting, often electric shock–like pain along the course of the affected nerve branch along with pain-free periods between attacks. The commonest neuralgic pains in orofacial region include Occipital neuralgia, Trigeminal neuralgia and Glassopharyngeal neuralgia. Trigeminal neuralgia is the most common of the cranial neuralgias and chiefly affects individuals older than 50 years of age. While a few have a detectatble underlying cause such as intracranial tumour or anaeurysm, most have no known cause. The diagnosis of TN is usually based on the history of shooting pain along a branch of the trigeminal nerve, precipitated by touching a trigger zone, and possibly examination that demonstrates the shooting pain. An enhanced MRI is done to rule out any intracranial lesion. The initial management of trigeminal neuralgia is usually medical with a group of drugs which are anticonvulsants such as carbamezapine, gabapentin etc. In cases in which drug therapy is ineffective or in which the patient is unable to tolerate the side effects of drugs after trials of several agents, Interventional or surgical therapy is indicated. The interventional pain procedures which are commonly done for Trigeminal Neuralgia are either done on the peripheral nerves such as mental nerve, infraorbital or mandibular nerve block or on the trigeminal or gasserian ganglion. 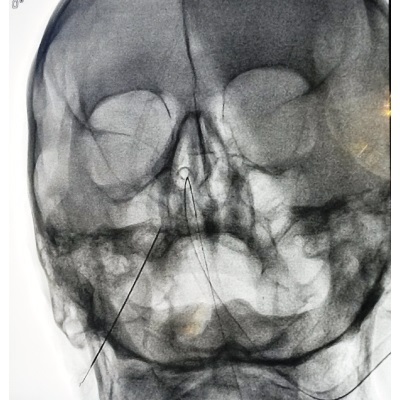 The commonest interventional pain procedure which is done at the level of trigeminal ganglion is the Radiofrequency ablation of T Trigeminal ganglion. 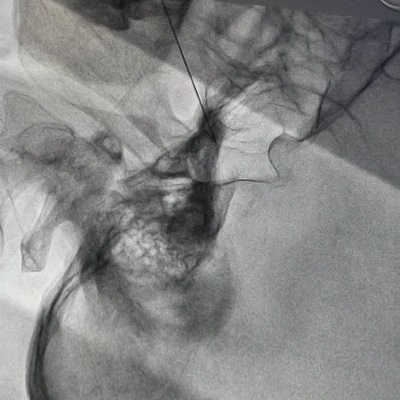 The other interventional pain procedure done at this level is Percutaneous balloon compression. 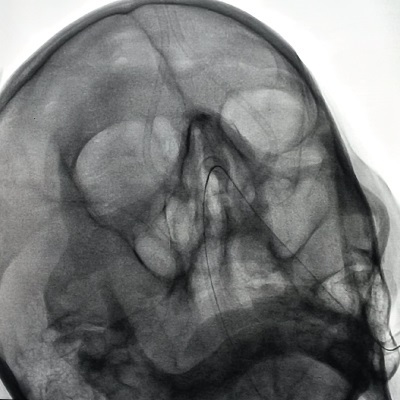 This is done under fluoroscopic guidance by passing a cannula through the skin and positioned in the foramen ovale. A fogarty balloon catheter is then passed and its tip is positioned in the meckels cave near the gasserian ganglion rootlets and balloon is inflated causing damage to the gasserian rootlets. It provides pain relief for longer period almost approaching the microvascular decompression surgery, which is done at the level of brain stem. Glossopharyngeal neuralgia is a condition that is associated with paroxysmal pain that is similar to, though less intense than, the pain of TN. The location of the trigger zone and pain sensation follows the distribution of the glossopharyngeal nerve, namely, the pharynx, posterior tongue, ear, and infraauricular retromandibular area. Pain is triggered by stimulating the pharyngeal mucosa during chewing, talking, and swallowing. The management of glassopharyngeal neuralgia involves glassopharyngeal nerve block which is used both for its diagnostic and therapeutic value. 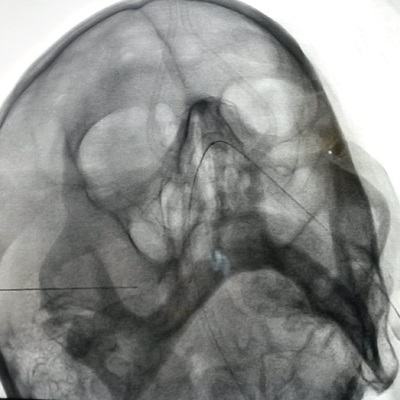 If pain is recurrent, Pulsed RF of glassopharyngeal nerve is done under fluoroscopic guidance and local anaesthesia. Occipital neuralgia is a rare neuralgia in the distribution of the sensory branches of the cervical plexus (most commonly unilateral in the neck and occipital region). Along with pain in the occipital and neck region, there might be some altered sensations in that region like tingling, burning etc. . Palpation below the superior nuchal line in the occipital region may reveal an exquisitely tender spot. Management includes blocking the greater and lesser occipital nerve with a local anaesthetic which is diagnostic as well as therapeutic for this condition. This is done as a minor OPD procedure either by landmark based approach or guided by ultrasound. The pain originating in temporomandibular joint or the masticatory muscles is suspected when the pain is localised to this region and occurs with functions such as speaking or eating or mouth opening along with a click noise from within the joint. The temporomandibular region pain is usually managed by a trigger point injection of masticatory muscles if trigger points are located on these muscles or a diagnostic temporomandibular joint injection with a local anaesthetic with or without a steroid under fluoroscopic guidance. The terms “atypical odontalgia” is used in this context when the pain is confined to the teeth or gingivae whereas the term “atypical facial pain” is used when other parts of the face are involved. These pains are felt as constant dull aching pain without an apparent cause that can be detected by examination or laboratory studies. These pains mostly occur in women in the fourth or fifth decade commonly after undergoing a dental procedure. For managing atypical odontalgia patient are counselled and reassured. Some of the Tricyclic antidepressants are useful apart from hormone replacement therapy which might be useful in some cases.